Little Squirts, figurines that were meant to squirt water out of an appropriate orifice. The book retails for $39.95. Want your book autographed by the author (me, of course!)? E-mail me your snail mail address and I will send you an autographed bookplate (please be sure to tell me who you want the book plate autographed for). 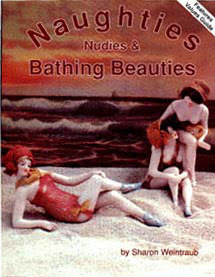 (OUT OF PRINT) Naughties, Nudies, and Bathing Beauties is the first reference book to cover bathing beauties and their sultry sisters. The book features 184 photographs, almost all of figurines from my own collection. Each category of collectible is discussed in detail, as are manufacture and manufacturers and the social changes that brought about the demand for these naughty novelties and risqué bisques. Although this book is now out of print, Amazon Books may be able to locate a copy through its book search. I have also been told that some copies may be available from Barnes and Noble. This book also often offered through eBay. Antique Doll Collector, April 2017, “Toy Ahoy! Floating Bisque Novelties of the Early 1900s,” about swimming badekinder and other floating German bisque toys. Antique Doll Collector, March 2017, "Her Naughty Hula Hips." The article is a followup to my December 2016 article and contrasts hula dolls created by Zaiden and Progressive Toy Company. Antique Doll Collector, December 2016, "A Whistle and a Shimmy; Clockwork Carnival Dolls of the 1920s." The article looks at the clockwork dancing dolls created by companies like Zaiden Toy Works for carnival concessionaires. Antique Doll Collector, September 2016, "Twice as Nice, Galluba and Hofmann Double Bathing Beauties." Antique Doll Collector, February 2016, "The Crocheted Critters of Carl Horn Nachf and Hertwig and Company." A look at the imaginative miniature menageries created in crochet by these two companies. Antique Doll Collector, April 2015, "From Elegant Edwardian to Fascinating Flapper; Mold 1469 by Simon and Halbig." Antique Doll Collector, July 2014, "Galluba and Hofmann, Always in Fashion." More about the Galluba and Hofmann tea-sipping trio who appeared in the 1983 Nina Ricci advertisement. Antique Doll Collector, August 2012, "Brave, Gay and Beautiful, German Flapper Ladies by Simon and Halbig and Armand Marseille." Antique Doll Collector, June 2009, "The Gorgeous Gals of Gebruder Heubach," picturing nubile nudes by this German company. Antique Doll Collector, July 2008, "Genevieve Pfeffer and Her Alluring Girlies," which sets out the history of the once hugely popular, but now largely forgotten, Splashme bathing beauty dolls. Antique Doll Collector, April 2007, "Petite Pets: Anthropomorphized All-Bisque Animals by Hertwig and Company", which features tiny cat, bear, bunny, duck, and monkey dolls, all in their original crocheted clothing. Coastal Living, November 2006, "Beach Babes," quoting yours truely and picturing two bathing belles from my collection. Antique Doll Collector, August 2006, "The Stunning Bisque Sisters of A.W. Fr. Kister," concerns the extraordinarily exquisite bisque bathing belles attributed to this little known factory. Lots of pictures of these elusive lovely ladies, including one that won a blue ribbon at the United Federation of Doll Clubs annual convention in Dallas in July 2006! Antique Doll Collector, November 2005, "Tiny Treasures and Miniature Marvels" discusses the tiny bisque dolls (under two inches tall!) in elaborately crocheted costumes produced by German companies such as Carl Horn Nachf and Hertwig and Company. The article includes lots of pictures of these most diminutive dolls. Antique Doll Collector, October 2000, "Good Things in Small Packages," about a family of all-bisque dolls manufactured by Hertwig and Company, found in their original box. Antique Doll Collector, April 1999, "German Fish Tank Fantasies," focuses on German bisque mermaids and features lots of color pictures of these fabulous finny femmes (along with a rare merman and two merchildren!). Antique Doll Collector, January/February 1999, "Half Sisters" shows how the German firm of Galluba and Hofmann modified some of its bathing beauty molds to create elegant half dolls, which were used to decorate pincushions, candy boxes, and other items. 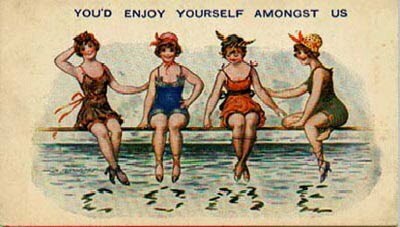 The article includes several color pictures of beautiful bisque bathers and their equally lovely half sisters. Are you a fellow lover of these elusive little lovely ladies? Have any questions or comments? Want to suggest another antique doll link? E-mail me at sharon@weintraub.name. I am always interested in purchasing fine quality naughties, nudies, or bathing beauties (as well as French or German all-bisque dolls), individually or as a collection!!! Also, I am always on the lookout for old German manufacturers' catalogues showing these figurines.